Larry Barnes, ‘The Viceroy of Versatility’, Finchley. © David Secombe 1990. Billed as the Viceroy of Versatility, Larry Barnes lived up to the promise. As one of the variety theatre’s last speciality acts, he was a magician, an escapologist, a balloon sculptor and most famously a paper tearer. His father introduced him to music hall when he was still a boy and, after only a brief stint at the Italia Conti Academy of Theatre Arts, he made his stage debut at the Adelphi in 1941/42 playing a pirate in Peter Pan with Barbara Mullen in the title role. After serving in the Second World War, he resumed his stage career and also worked as a stunt man in films, including The Colditz Story (1955). 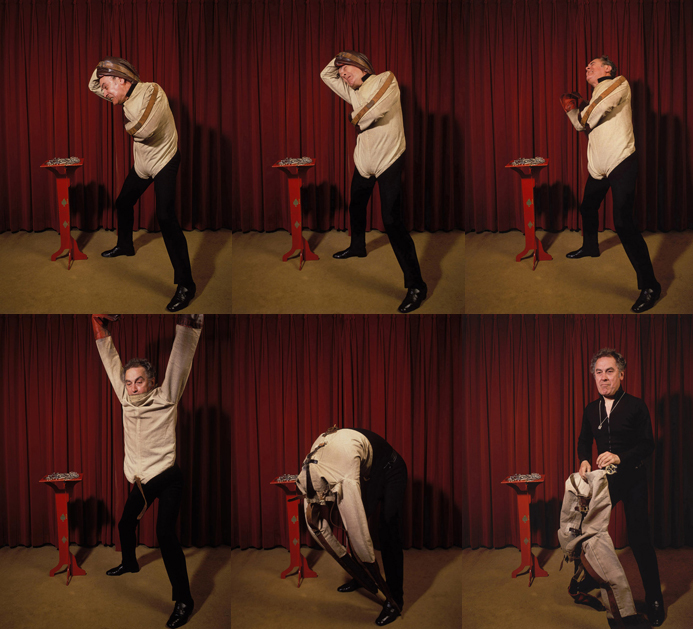 These photos showing Larry Barnes demonstrating his version of Harry Houdini’s straitjacket routine were made at the home of Larry’s assistant (who was also a Justice of the Peace) in Finchley. The photos were commissioned for a Sunday Times Magazine feature on ‘Speciality Acts’, which were having something of a revival at the time – the term covered old-timers like Larry and the new breed of more outre ‘New Variety’ performers such as the ‘regurgitator’ Stevie Starr, another on my list of subjects. Larry arrived at his assistant’s later than billed, dressed in an extravagant outfit which spoke of the theatricality of an earlier era; unfortunately, his stylish presentation was the reason for his lateness, as he had been mugged on the Victoria Line by some football supporters who took exception to his appearance and stole his carpet-bag of props. The bag was thrown onto the platform at the next stop, but Larry had had to go to Brixton to retrieve them from lost property. Amongst other things, the bag contained Larry’s prized handcuffs, allegedly the property of Houdini himself – although it has to be said that Larry was a bit vague on their provenance. But Larry’s tour-de-force was his straitjacket escape, which provided this photographer with a sequence of a dozen images which – by accident rather than design – look like some kind of collaboration between Edward Muybridge and Francis Bacon. The pictures only give a hint of the tremendous effort Larry put into this stunt, but I like to think that his expression in the final image gives an indication of the nature of his achievement. Quite literally, Larry shows us what it means to be free. Larry Barnes, born Islington May 16, 1926; died Hackney, July 2, 2011.